Gov. Gen. David Johnston has presented the first 60 Diamond Jubilee medals to Canadians at a Rideau Hall ceremony. 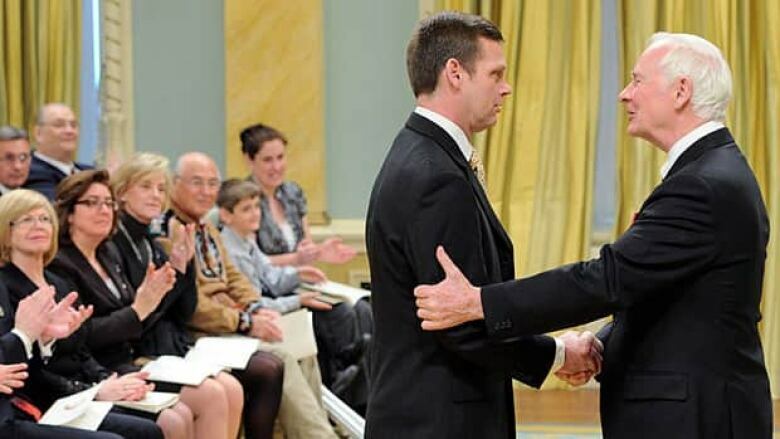 Freestyle skier Alexandre Bilodeau, Terry Fox's brother, and entrepreneur Brett Wilson were among the first 60 Canadians awarded the Diamond Jubilee medal for their work in community service. Celebrations kicked off across the country Monday to commemorate the day Queen Elizabeth became sovereign on the death of her father, King George VI, 60 years ago. About 60,000 Canadians are to receive the medal over the course of the year. Worldwide celebrations of the Diamond Jubilee will continue for four months, culminating in a lavish ceremony in London on the anniversary of the 1953 coronation. Gov. Gen. David Johnston presented the medals at a ceremony at Rideau Hall, which Prime Minister Stephen Harper also attended. The Diamond Jubilee medal recipients come from all walks of Canadian life, with many working to help military families or for other charitable causes. Among the most recognizable names on the list of medal recipients were Bilodeau, who won a gold medal at the Vancouver Olympic Games; Leslie Natynczyk, the wife of Canada's top soldier; Darrell Fox, who has continued his brother's fight to find a cure for cancer; and Maureen Basnicki, honoured for advocating on behalf of victims of terror. Basnicki's husband, Ken, was killed in the 9/11 attacks in New York City.